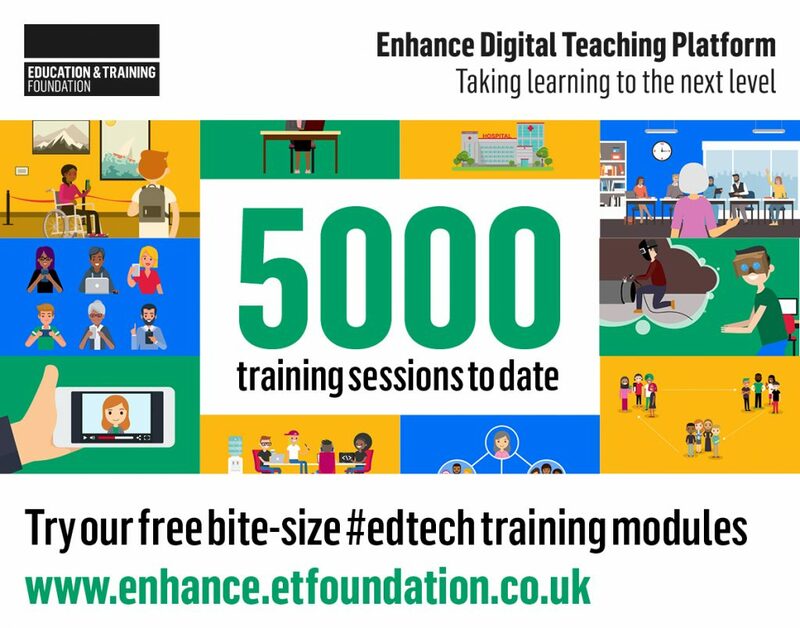 Since being launched on 25 January, 5,000 training sessions have now taken place on the Education and Training Foundation’s (ETF) Enhance Digital Teaching Platform. The Department for Education funded online teaching tool now offers 40 free modules to support teachers and trainers across the Further Education (FE) and Training sector to develop their practice using technology. The Enhance Digital Teaching Platform has been designed to help practitioners develop understanding of how to redefine their teaching approaches with learning technologies in line with the ETF’s Digital Teaching Professional Framework (DTPF). The online platform and DTPF are relevant to all types of teachers, trainers and assessors across the FE and Training sector, including those working in colleges, adult and community education and work-based training. Developed and built in collaboration with Jisc, the DTPF promotes a set of professional standards for supporting learning through technology with the aim to establish a common understanding of digital skills development. It is mapped to the ETF’s Professional Standards and Jisc’s Digital Capabilities framework and draws on the EU Framework for the Digital Competence of Educators. The free, bite-size training modules have been designed to be compact, easy to access anytime, anywhere, on any device, and are linked to digital achievement badges at the three stages of personal development set out in the DTPF – Exploring, Adopting, Leading. The digital badges can be used to share progress and achievement on social media and can be added to a LinkedIn profile or a CV as evidence of competency. “We are encouraged by the number of training sessions that have already taken place on the Enhance Digital Teaching Platform. It shows how important it is to teachers and trainers to help develop their practice. Module topics include using digital technologies to share and exchange practice, supporting and guiding learners using a Virtual Learning Environment, collaborating with learners synchronously, and digital well-being. The most popular modules for users are currently ‘E-portfolios for Professional Learning and Development (PLD)’, ‘Using hashtags’ and ‘Recording teaching sessions’. More information on the Enhance Digital Teaching Platform and Digital Teaching Professional Framework can be found on the ETF website. Watch Vikki Liogier’s webinar on using the Enhance Digital Teaching Platform on the Society for Education and Training (SET) website.